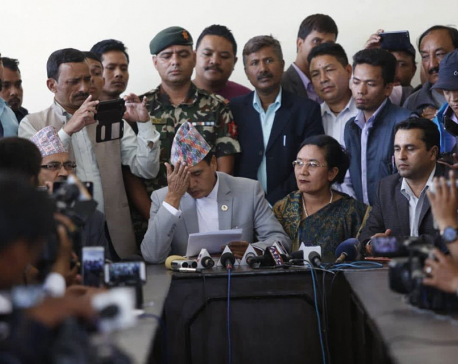 KATHMANDU, April 4: Expressing serious reservations over a controversial verdict relating to a Rs 61 billion tax waiver handed down by the Supreme Court in the recent past, newly-appointed Law Minister Sher Bahadur Tamang has spoken of placing the justices responsible for issuing such a verdict under scrutiny. Speaking at a press conference organized to brief media about the progress made so far in the formulation of various federal and provincial laws, Minister Tamang claimed that several cases of tax waiver involving billions of rupees have been the subject of interim orders from the Supreme Court. “These cases must have drawn the attention of many. If any case of tax evasion is found to have been settled under undue influence, it shall be scrutinized and those responsible shall not be spared,” he said. Tamang claimed that there had been corruption involving billions in tax-related cases. “So, we will look at the verdicts in such cases. The Judicial Council (JC) can also study such verdicts. The Judicial Council Act has clearly provided the authority to study such verdicts, but there has not been any such study so far,” he said. He said that as authorized by the JC Act, the government is working to purify the judiciary and make it more pro-people. The minister said there have been precedents where some justices faced action over controversial verdicts. His ministry was currently working to amend the Judicial Council Act to make the judiciary independent. Venting ire against the current practice of justices and judges attending functions organized and sponsored by INGOs, he said the amendment would give additional priority to the code of conduct for justices and judges in order to ensure speedy justice delivery. Stating that billions of rupees spent by various donor organizations to provide legal aid to the poor was grossly misused, Minister Tamang said his ministry was making preparations to introduce a one-window system to ensure that donors channel their funds through the government. “According to a 2016 report, various donor organizations have already spent over Rs 4.20 billion on legal aid in the country. But this aid remained largely ineffective. We found that billions were spent on foreign trips and seminars; but the victims never benefited,” Tamang said. He said making it mandatory for donor agencies to channel their funds through the government would put an end to malpractices. “We will regulate foreign aid through a committee under my chairmanship to ensure access to justice for people who are weak financially,” he added. Provision of free legal service to those who cannot afford it has been enshrined as a fundamental right in the constitution. In order to ensure that genuine victims do not remain without access to justice for lack of money, the ministry has drafted an integrated legal aid policy. This was unveiled by Minister Tamang at the ministry on Tuesday.